Caterina di Giacomo di Benincasa was born on March 25, 1347, to Giacomo di Benincasa, a cloth dyer, and his wife, Lapa. She was the 24th of 25 children, and joined the third order of St. Dominic in 1365. Jesus joined himself to her in a “mystical marriage”, and bade her express her love through action. She attended to plague victims, brokered peace between warring factions in Italy, dictated The Dialogue (a conversation between the soul and God) and was instrumental in moving the papacy back to Rome from its post in Avignon, France. She died at the age of 33 after suffering a stroke. She was canonized by Pope Pius II on June 29, 1461.She was the first member of the laity to be made a Doctor of the Church (given by Pope Paul VI on October 3, 1970). She is one of the co-patronesses of Italy, along with St. Francis of Assisi, co-patroness of Rome, and co-patroness of Europe (along with St. Edith Stein and St. Bridget of Sweden). In addition to all this, she is also one of my Dominican patrons. So, happy St. Catherine’s day! Today (a day before it’s released in stores, go Ignatius Press!) I read Jennifer Fulwiler’s long-awaited (really, I’ve been clamoring to read this) memoir/conversion story, Something Other Than God. I knew that her writing style was by turns serious and laugh out loud funny, so I was expecting the same thing in the book, and I wasn’t disappointed. The book isn’t a blow-by-blow account of Jen’s life. What it is is a story about how God worked in her life from its earliest stages, even if she didn’t realize it. Raised by non-religious parents, she considers herself an atheist for most of her life, but still can’t shake the feeling that there is more to life than just…this. When she meets her husband, Joe, she slowly starts to consider Christianity. Joe is a Christian but he doesn’t take it seriously, but he does believe in Jesus. And through conversations and reading books like Mere Christianity and Orthodoxy, and writing out her objections to Christianity on her blog, Jen starts to think that Christianity might have something going for it. If Jesus Christ is real….then we aren’t in a lonely abyss hurtling toward annihilation. If Jesus Christ is real…..
A whole new vista opens up for Jen. Eventually, she and Joe decide they’re going to become Catholic, and start the RCIA process. But at the same time, Jen becomes pregnant with their second child–and develops a life-threatning blood condition that could be potentially fatal if she has any more babies. I have to say, this is the part of the book that really hooked me, because I’ve been in her shoes. Even before transplant, my medication regimen was complex. A lot of the drugs I take now are absolutely verboten if you’re pregnant. Absolutely. When I was in college, and was engaged, this was a huge thing for me. Getting pregnant would be horribly not good for me and the baby. But I was–and am–Catholic. I am not going to use birth control. How in the world do we reconcile the two? I loved reading about Jen’s mental process through all of this, because I’d been there. 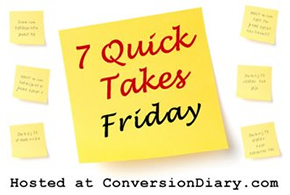 Jen’s conversion story isn’t fluffy, pretty, God-appeared-to-me-and-said-do-this! variety. It’s a real story. It has meat in it. Jen struggles and she lays those struggles out for us. She has questions, she has doubts, she prays to God in a bathroom and sneaks away to read the Bible, afraid she’ll get “outed” as the former atheist turned Jesus Freak. And this is the first Catholic book I’ve ever read where the author says she prayed for the soul of a deceased rapper–which makes Jen all the more relatable to me. While we probably haven’t met Tupac (the rapper she prays for), we all know people who live lives that may not be all good–but they believe in God. I stared at him, searching his face for the smile that would accompany the punchline to this dry joke, but it didn’t come. In his eyes was a gentleness, a bottomless vulnerability that I had never seen before. Really, that sums up the whole book, and why I needed to read it right now. Jennifer has done amazing work here. Read the book, and then read it again, and attempt to put God first. The sacramental and liturgical life of the Church helps us grow ever more in our ability to recognize the obstacles that impeded the Lord from drawing closer to us. Thus we should look forward to and welcome each season, all solemnities and holy days, and every Sunday. We should gladly and frequently celebrate the sacrament of confusion. We should willingly build our lives on the foundation of daily meditation, opening ourselves to the Lord, speaking and listening to Him from the interior of our hearts. It’s a rainy Monday. I think Karen Carpenter had something to say about that? My PJs. I’ve been sleeping fairly horribly lately so getting up around 930 has been my M.O. Oatmeal is simmering away on the stove, though, so that’s happy. In the home stretch of St. Faustina’s Diary; Wings of the Dove; and The Goldfinch, which I just sort of starting reading at auditions on Friday. Might have to seriously start on that today. 1996 cast of Jesus Christ Superstar. I just love that stuff. It’s Monday so tat means dusting and vacuuming and mopping–beginning of the week stuff. Oatmeal, as I mentioned, for breakfast, with blackberries. Lunch is a peanut soup from Oh She Glows!. Dinner is mustardy pork chops from Dinner, a Love Story, and it’s one of my favorite recipes. Today is definitely fall in its temps and weather, so I’m going pork chops. 🙂 I have to meal plan for the week post breakfast. My Crock-Pot performed admirably last night, though, in the making of a Moroccan Stew, which was amazing. It made the whole house smell like cinnamon. Never a bad thing, that. You’ve put your faith up for auction; notice its price. That’s not what it’s worth, it isn’t to be valued in gold or silver, that’s not what your faith is worth. It has a huge price tag; God Himself is its price. Love Him, and love Him freely, for nothing. You see, if you love Him on account of something else, you aren’t loving Him at all. You mustn’t want Him for the sake of anything else, but whatever else you want you must love for His sake, so that everything else may be referred to love of Him, not so that He may be preferred to other loves. Love Him, love Him freely, for nothing. Formatting my one short story for potential publication on Kindle. I’m excited about this thought. It’s about Pilate’s wife. Pulm Rehab today and Wednesday and other than that, not a lot. Three more CCD classes left for the year. I’m going to miss my kids. Well, maybe not subito (immediately). But, still good. And on the feast of Divine Mercy–extra perfect. The present-day mentality, more perhaps than that of people in the past, seems opposed to a God of mercy, and in fact tends to exclude from life and to remove from the human heart the very idea of mercy…Humanity and the modern world need so much. And they need mercy although they often do not realize it…. Mercy is in a certain sense contrasted with God’s justice, and in many cases is shown to be more not only more powerful than justice but also more profound…Love is “greater” than justice; greater in the sense that it is primary and fundamental. Love, so to speak, conditions justice and, in the final analysis, justice serves love. The primacy and superiority of love vis-à-vis justice–this is the mark of the whole of revelation–are revealed precisely through mercy. This seems so obvious to the psalmists and prophets that the very term justice ended up by meaning the salvation accomplished by the Lord and His mercy. Mercy differs from justice, but is not in opposition to it. Happy Almost Divine Mercy Sunday! And almost two popes Canonization Day! OK, I realize, if you’re not Catholic, you don’t care about the above two things, but….oh well. 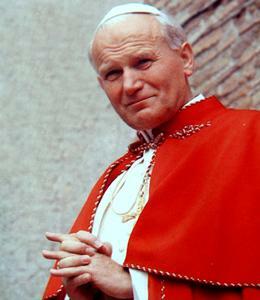 I am especially excited for the canonization of John Paul II. His Papacy covered the first 23 years of my life, and even now, it’s still sort of hard to think he’s not here anymore. He was a giant of his age (OK, any age, really). My parents were married under his reign, me and my siblings were born, I received all my sacraments…he colored everything during my growing-up years. Such witness. And I don’t think I need to say that his example in suffering has been incredibly helpful to me. Right now I’m reading his encyclical Veritas Splendor–the Splendor of Truth. Having been growing up during his papacy, I obviously missed reading a lot of his writings as they initially came out. So I’m doing catch-up now. CCD starts back up this week, and I’m the teacher of the week. 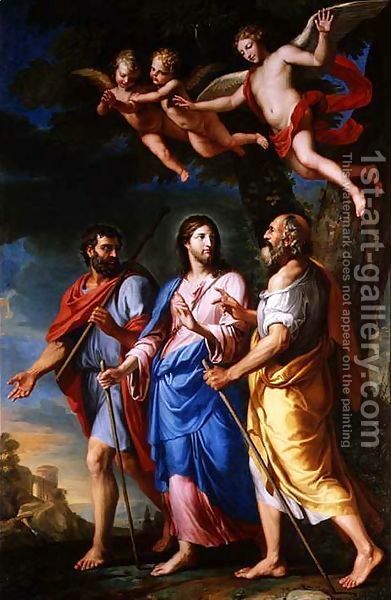 We’re talking about the Ascension. There’s only four weeks left in the CCD year, which I’m having a hard time imagining. This year’s class has been a great group of kids and I’ll miss them. Auditioning for The Music Man tonight–summer theater production. So dusting off the resume and the music books. Pulm Rehab is also going well. Today was supposed to be my last day but we extended it into May because I seemed to be making progress, and we don’t want to stop the progress train. 😛 Progress does not mean I’ll be running the Boston Marathon any time soon (read: EVER), so get that out of your head. I’m hoping to get to the Met’s Live in HD presentation of Cosi Fan Tutti tomorrow. I’m not a huge Mozart fan, except for his operas, so I’m trying to see more of those (the only ones I’ve seen in Don Giovanni and Le Nozze Di Figaro). I love that the Met does this– basically, it’s the live performance streamed into movie theaters all over the world, so you get to see what the people in the opera house are seeing, without, you know, flying to NYC and paying lots of money. One of my bucket list items is to see a production in the house, but this is a good substitute until I get there. Hoping to teach myself a new and better way to cast on knitting projects this weekend, because the one I use doesn’t really work. I need to have a better one in my repertoire for better projects! CBS Sunday Morning feature on the Benedictines of Mary and their record-breaking music.